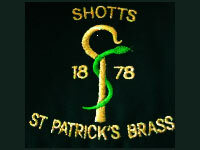 Support Shotts St Patricks Brass Band via Easyfundraising! Raise funds for the band as you shop online! Simply visit www.easyfundraising.org.uk, search for - and register to - support our cause then either visit your online retailer via this site or install a donation reminder on your phone, PC or device and each time you shop online, the retailer you use will donate a % to Shotts Brass Band! Donate as you shop! If you are a Co-operative member simply select Shotts Band as the local cause you wish to support and a % of your spend on Co-operative branded products - as well as a donation from carrier bag sales - is donated to the band! Shotts St Patricks Brass 200 Club! Shotts Brass Band run a weekly draw. Tickets cost £1 per week and offer you the chance to win £100 each week whilst helping raise much needed band funds! Funds can be paid by monthly standing order - to find out more drop us a message via the contact us page or email shottsbrassband@hotmail.co.uk. Click on our logo here to view the weekly sweep winners!